Meteorologic conditions at field level in Olympic Stadium were measured by the National Weather Service in preparation for the 1996 Summer Olympic Games. In the summer of 1996, millions of visitors arrived in Atlanta to watch the world’s finest athletes compete for the coveted gold. Spectators watched as highly skilled men and women competed in strenuous sports such as track and field, mountain biking, rowing, and soccer. Conditioning and the ability to adjust to the weather conditions determined who was the best in his or her event. However, spectators were sometimes oblivious to the environment and the dangers posed to the athletes by inclement weather conditions. And, the 1996 Summer Olympic Games were held during the hottest time of the year. To ensure the success of these Games, the National Weather Service (NWS), an arm of the Department of Commerce’s National Oceanic and Atmospheric Administration, provided weather support to the Atlanta Committee for the Olympic Games (ACOG), and to athletes, spectators, and media. Weather conditions were monitored using an array of sophisticated equipment. In addition to the latest satellites and Doppler radars, a network of monitoring stations reported current surface conditions to two NWS Olympic weather support offices in Georgia. The backbone of this dense monitoring network was formed by Campbell Scientific CR10-based weather stations that made up the University of Georgia’s Automated Environmental Monitoring Network (AEMN). The AEMN was supplemented by additional stations installed by NWS in data-void areas to generate the data needed to support high-resolution numerical models. AEMN was established in 1991 by the College of Agricultural and Environmental Sciences at the University of Georgia. The main objective of the AEMN is to collect detailed weather data at agricultural research sites. In addition to supplying data for physical, chemical, and biological studies, the detailed weather information is input to the latest computerized agricultural simulation models and decision-support systems. AEMN began with four CR10-based stations and currently consists of 31 stations. Each station is accessed by a modem and dedicated telephone line. A personal computer in Griffin calls each station at least once a day to download the previous day’s data. After downloading, the data are processed for applications and archival. The retrieved weather data has become an invaluable and important resource for many entities. Daily summary reports are automatically faxed to local newspapers, television stations, utility companies, and various agricultural enterprises. Monthly summary reports are distributed to a range of clients in agriculture and other industries. Three stations have VS1 Voice Synthesized Telephone Modems that provide verbal reports of current weather conditions. 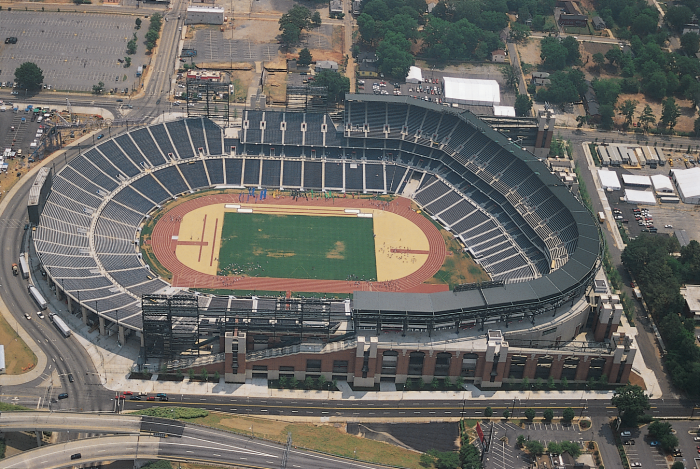 The value of AEMN to the NWS in supporting the Atlanta Games was recognized as early as 1991. At that time, ACOG requested that the NWS collect weather data at six potential sites for the equestrian venue. Due to the high temperature and humidity conditions during Georgian summers, an alternate site was being sought. During July and August of 1991, CR10 dataloggers operated by AEMN recorded detailed temperature, relative humidity, wind speed, and wind direction data. This information was provided to ACOG, and the Georgia International Horse Park in Conyers was selected as the final venue. In response to a subsequent request from the NWS, the University of Georgia bought and installed eight additional weather stations to support the Games. These units recorded data at the Georgia International Horse Park in Conyers (equestrian, modern pentathlon, and mountain bike racing); Lake Lanier in Gainesville (kayak sprint, rowing, and canoeing); the Ocoee River in Tennessee (canoe and kayak slalom); Williamson Island in the Wassaw Sound near Savannah (yachting); and Atlanta Beach in Jonesboro (beach volleyball). The remainder of the stations were installed at critical sites where additional climatological information was needed. The NWS has numerous offices and associated Automated Surface Observation Systems (ASOS) that provided weather information during the Games. Despite the availability of the ASOS and AEMN stations, gaps remained in the network. To remedy this, the NWS purchased an additional 14 CR10-based weather stations in 1995. Stations were installed at venues including Wolf Creek (shooting); Clark Atlanta University (field hockey); Georgia Institute of Technology (swimming, diving, and water polo); and Stone Mountain Park (tennis, archery, and track cycling). The remainder of the stations were installed in critical climate regions of Georgia and Alabama. Additionally, two temporary stations were mounted on wheels to monitor weather conditions inside the new Olympic Stadium. All the CR10-based stations monitored air temperature, relative humidity, wind speed, wind direction, and rainfall. The AEMN stations also monitored solar radiation and soil temperature, so their programs were modified to accommodate the data requirements of the sophisticated NWS models. All sensors were scanned at one-second intervals and the data were averaged every 15 minutes. Daily summaries and extremes were calculated at midnight. Other networks supplying weather data included the Alabama Mesonet managed by Auburn University, the fire weather station network of the Georgia Forestry Commission, and various automated stations located in Tennessee and the Carolinas. The NWS operated two weather offices during the Games; one in Peachtree City and the other near Savannah, Georgia. Both offices interrogated each station at 15-minute intervals. Multiple computers handled this task, as each interrogation session lasted about 60 seconds. The data was then fed into high-resolution models that handled large amounts of input data. The models were run on supercomputers every 15 minutes to provide weather forecasts for each venue. The data was then processed and transmitted through ACOG’s information system to venue management officials, sports officials, coaches, and athletes. The legacy of this effort to support the 1996 Olympic Games will be the tremendous amount of data being archived on CD-ROMs. These data will be available for studies involving localized climate, spatial weather variability, thunderstorms, sea breeze conditions, convection, and other meteorological phenomena. The weather data may also provide an impetus in convincing others to develop similar networks that will improve weather services to their communities. Gerrit Hoogenboom, Department of biological/agricultural engineering, University of Georgia, Griffin, GA; Carlos Garza, Peachtree City Forecast Office, National Weather Service, NOAA, Peachtree, GA.